DELIVER ECOYA FOR MOTHER`S DAY 2018! 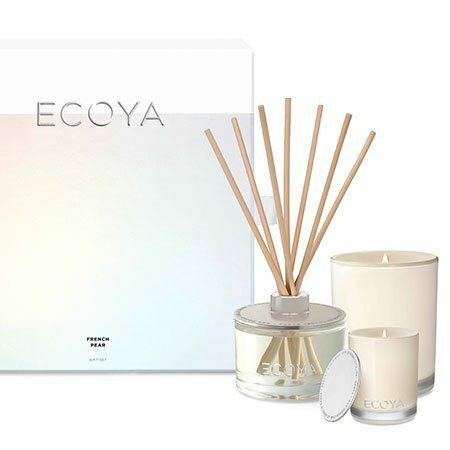 As a gorgeous alternative or addition to fresh flowers for Mother`s Day, why not spoil mum with a luxury home fragrance gift set by ECOYA? Our French Pear Gift Box by ECOYA is a premium gift that includes a natural soy wax Madison and Mini Madison candle (one for the bedroom, one for the bathroom!) and a full size diffuser to make the house smell delicious! ECOYA`S French Pear fragrance captures the essence of a crisp, tree-ripened Queensland pear, blended with a hint of the creamiest vanilla and infused with clove for a rich, sophisticated scent. 1 X 400g French Pear Madison Jar Candle: burn time of up to 80 hours. 1 X 80g French Pear Mini Madison Candle: burn time of up to 25 hours. 1 x 200ml French Pear Fragranced Diffuser: lasts up to six months.